In 1957, a controversial expedition including acclaimed B.C. artist Bill Reid and anthropologist Wilson Duff was sent to remove and preserve totem poles from the abandoned Haida village of Ninstints. The conflicts it generated, both externally and within, are the subject of the brand-new musical Beyond Eden. Writer Bruce Ruddell weaves fantasy with history as he delves into the moral dilemmas faced by the expedition. The characters have also been fictionalised; Reid is now Max Tomson (Cameron MacDuffee) and Duff is now Lewis Wilson (John Mann). 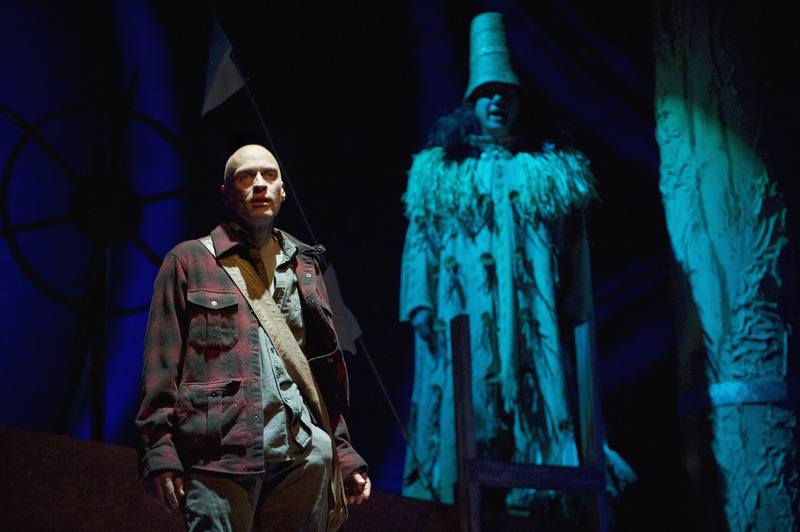 John Mann and Tom Jackson in Beyond Eden at the Vancouver Playhouse. Wilson struggles with his desire to preserve the totem poles before they decay and are lost and his respect for the Haida beliefs and traditions. The mixed-race Tomson is also on his own journey to recognising and reclaiming his heritage. Mann, of Spirit of the West fame, is in fine form, vocally and dramatically. Tom Jackson (North of 60) deftly plays the Watchman, a mystical guide intent on protecting the totem poles from Wilson’s interference. The fallback into over-used stereotypes, which at times threatened to derail the production, is carefully tempered by the beautiful imagery. There are some stunning visuals on display here, including a sequence of canoe lanterns floating above the heads of the audience, and luminescent totem poles given life as their projected carvings take motion. Bretta Gerecke’s evocative set involving ramps and angled poles is flawless. Composer Bill Henderson’s score is serviceable but mostly forgettable. The use of traditionally-inspired Haida music by Gwaai Edenshaw, however, is seamlessly integrated and rises far above the weaker elements. There are also some valiant efforts to incorporate basic character development to add some humanity to the history, but these fall way short of their goal. The subplots involving Wilson’s attempts to reconnect with his son and wife are meandering at best and come off as insincere. Jennifer Lines’ performance as Wilson’s wife is well-executed, but the character, as written, is superfluous and adds little to the production. The musical is steeped heavily with both ambition and gravitas, which mostly serve it well. As a historical narrative, it hits the mark; as a musical, it’s lacking. Though the script and score could do with a major renovation, overall Beyond Eden is visually and thematically haunting. The Vancouver Playhouse and Vancouver 2010 Cultural Olympiad in co-production with Theatre Calgary present Beyond Eden from January 16 – February 6, 2010 at the Vancouver Playhouse, Hamilton and Dunsmuir. Tickets are available online or by phone at 604-873-3311.